For over 30 years, Ther­ma­Cote®, Inc. has developed and produced a line of technologically-advanced weather barrier and pro­tec­tive coat­ings that add energy effi­ciency and safety to any sub­strate or struc­ture. Our products seal the envelope of any structure, and do not pol­lute the indoor or out­door envi­ron­ments to which they are applied. Our purpose is to provide our customers with efficient solutions to address energy loss and safety concerns, corrosion problems and personnel protection through products which as well improve other building and engineering disciplines. We do what is needed to develop tailored and sometimes very specific application solutions for our customers, to fit their requirements. Our goal is to expand our network of certified applicators and re-sellers in the American hemisphere while developing multiple distributors overseas around the world to open new markets. We also plan to continually develop environmentally friendly products that will address the specific needs of multiple industries addressing topics from energy savings to increased public safety while maintaining our founding with a responsible approach to our own impact on the environment as well as that of the products we choose to manufacture once they are installed. ThermaCote® shall put the needs of our clients above all else as we seek energy sav­ing solu­tions that rep­re­sent our com­mit­ment to lead­ing edge prod­uct per­for­mance. Our aim is to con­tin­u­ally improve through con­stant research and development and prod­uct test­ing, and by main­tain­ing excel­lent qual­ity con­trol stan­dards through our ISO 9001:2008 cer­ti­fi­ca­tion pro­gram. We will strive always to attain suc­cess for our cus­tomers, asso­ciates, and indus­try professionals. Tommy Sharp Sr. founded ThermaCote® in 1985 to man­u­fac­ture a durable and energy- saving weather bar­rier for the con­struc­tion indus­try. Pre­vi­ously, the Sharp fam­ily had been installing foam insu­la­tion prod­ucts dur­ing the 1970s, before there was any real knowl­edge or under­stand­ing about VOC’s (volatile organic com­pounds) and off- gassing chem­i­cal fumes within the inte­rior envi­ron­ment. It was decided that the most envi­ron­men­tal and eco­nom­i­cal prod­ucts could be devel­oped ‘in house’ and insu­lat­ing coat­ings were the pri­mary objective. Tommy Sharp Sr’s search for bet­ter mate­ri­als led him to cre­ate a light­weight con­crete block that floated on water while maintaining its struc­tural qual­i­ties, and this discovery led to the invention of ThermaCote®. 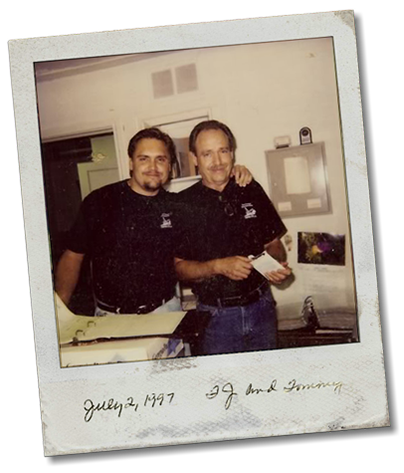 Tommy Sharp Jr joined the company in the 1980s and father and son worked together to bulid ThermaCote® and expand the business worldwide. Today, Tommy Shapr Jr continues his father’s legacy by develop new prod­ucts that add energy effi­ciency and safety to any sub­strate or struc­ture with­out pol­lut­ing the indoor or out­door envi­ron­ments to which they are applied.